Good news! 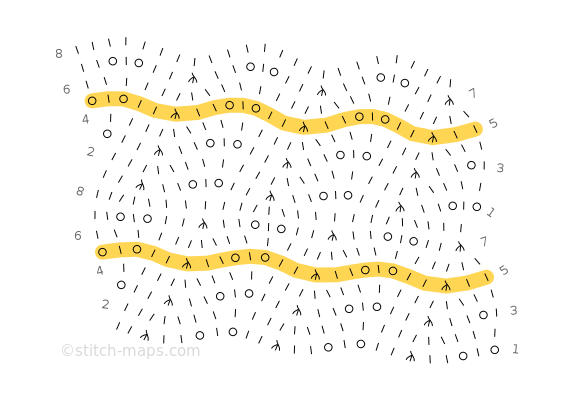 When it comes to drawing pretty pictures, Stitch-Maps.com is now faster than ever before. Specifically, after figuring out where all the symbols in a stitch map belong (which is the most time-consuming part of the process), the site now squirrels this information away in a more efficient manner. As a result, all related images – with or without column guides, with or without stitch counts, etc. – are drawn much more quickly. As long as you’re talking about the same stitch pattern, with the same number of horizontal and vertical repeats, you’re going to see dramatically improved speed. This is especially good news for subscribers using current row highlighting. Picture this: You want to knit Pitsilised Koekirjad #184. You ask the site to display three horizontal repeats, and two vertical repeats. The site might pause if it’s never been asked to display this before... but from that point forward, you’ll be able to click from one highlighted row to the next with hardly any pause at all. PS. Yes, I also intend to make the code that figures out where all the symbols belong (aka “the layout code”) faster, so any initial pause is minimized too. All in good time, my friends!